Plastic material is supplied in various thicknesses and sizes of cylinders suitable for one-piece bracelets, which can be plain, carved, two-color or ornamented with metal or rhinestones. A few contours are suggested in Figure 22. Bracelets are another case where as much or as little work as desired can be put into them, with any amount of time well repaid. Equipment required can vary from merely a hand-saw and file to a good lathe and power carving equipment, and in either event a beautiful, colorful, original and novel article can be turned out. Material of different colors can be cemented together, or small pieces of contrasting color can be cemented on, even bits of rare wood are sometimes cemented on, and carving applied as desired. Other very interesting bracelet-designs will be found in Plates 3C and 3E, 3F. A "Ten-Dollar Clock" in Plastics For A Dollar Project No. 9 Materials: 1/4" sheet, round-rod. 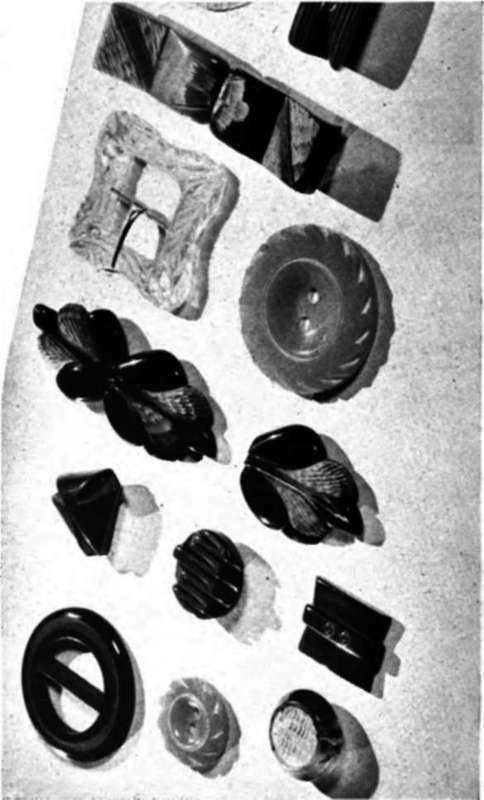 The principle in plastics design, of making the most "show" with bulk and air, and only a little material, is exemplified in this article, wherein a clock the equal in size and appearance of those selling in the better shops for ten dollars and upwards, can be made at a cost of only a dollar or less for material. (See 4E). PLATE 2R, (Upper left). Low-priced costume jewelry of the type being mode when this group of machine pictures was taken. PLATES 2S. 2T. 2U. Quantity-production methods of (1) hand-ashing with "mud-wheels", (2) tumbling, (3) attaching findings, clips, etc. with a foot-press, after the material has been softened by heating. PLATE 2V. (Lower left). More expensive merchandise is frequently hand-finished. This shows a fancy buckle, held in a special wooden "jig", being hand-polished after tumbling to put on the final high lustre and remove the wax contained in the previously-used polishing compounds. PLATE 2W. (Above). A battery of carving-spin-dles in operation. Each man does one particular kind of cut, and passes the piece to the next man. PLATE 2X (Right). A group of papular types of the more expensive grades of costume jewelry. The same msterials and machines are used to make all grsdes. the only difference being the greater amount of time spent on the better types. PLATE 3A, SB (Above). Various designs of arvcd rings, made from ring-tabes. PLATE 3d. (Below). The Scottle-blotter (Project No. 7). made from a special Scottie shape or jig-sawed from sheet, and cylinder-scrap. PLATE 2Z. (Below right). Two types of boxes turned from standard cylinders, and the cigarette box described in Project S.
PLATE 2Y. 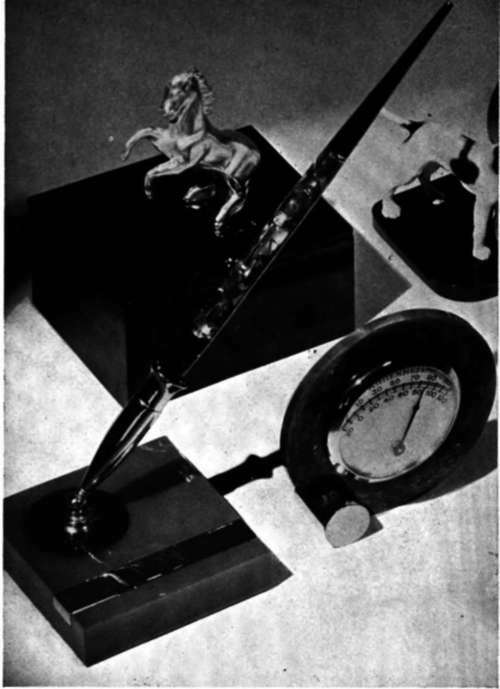 The desk pen-set and thermometer-clock described in Projects 23 and S.
The design given herewith is of natural-finish maple which in itself is a "modern" wood, and is trimmed with plastics in a way that looks liberal and expensive, yet which in all amounts to only a trifle, considering the results. In all, the materials should cost less than a dollar, and the works, unless you are going into production, can be anything you have on hand except the ordinary square alarm frame. In quantity, the type of works, spring or electric, employed in this clock can be bought for anywhere from 70c to $1.25. The best type is the one-hole mount, which is held to the face by a nut which goes on the stem. The secret of the inexpensiveness of this design Figures 24 and 25, lies in the use of a block of maple for the body of the clock, making up the "bulk" while the plastics used, while appearing to constitute the major portion of the clock, are merely some small pieces weighing less than a half pound, and if you are only making one clock, you no doubt have enough scrap on hand to serve the purpose. Fig. 24. 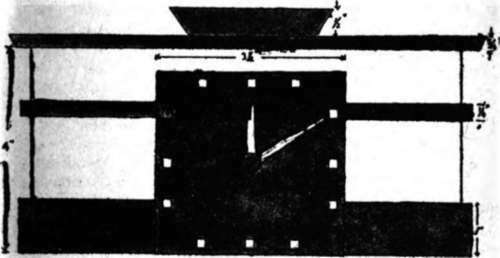 Plan of the clock in Project 9. Actual hole dimensions depend on the sine of the works being- used. Fig. 25. Face view, the shaded portions representing plasties, the balance wood. The first step is the block. This consists of a piece 7 3/4" long, 4 inches high and 1 3/4 inches thick, cut with the grain running in the 4 inch direction. The ends are rounded as shown, with a plane, planer or drum-sander, and a hole bored in the block to fit the works. Then the entire block must be sanded and finished before the other parts are attached. A French finish, or just two coats of shellac lightly sanded and rubbed down will do. On the top of the block is a cap of 3/16 inch or 1/4 inch plastic sheet 7 1/2 inches long and 2 inches wide, with the ends shaped to the contour of the block. The handle which sits on top of this in the center is a piece of 1/2 inch or 5/8 inch rod, slightly flattened on the bottom with the ends cut diagonally. Six caps this size can be cut out of the standard 6x16 sheet, or three from the 6x8 sheet. The face is a 3 1/2 inch square of 3/16 inch sheet, while the hour-marks in the original were chrome-plated square-headed upholstery tacks. If you can't get these, thin quarter-inch squares of white or ivory plastic will serve the purpose as well. The bands wrapped around the face of the block are interesting —they are made from pieces of bracelet-cylinder, with the curvature altered slightly by heating. Very little change is needed. The material is first immersed in water near boiling for about five minutes, then the pieces are clamped to the block or to another with the same curve, and allowed to cool for five or ten minutes. The operation is very simple and you should have no difficulty with it, but for greater accuracy or for production work, you can build a bending jig such is is illustrated in Figure 18. If the bend is not just right the first time, the material can be re-heated, until the total time it has been under heat is about twenty minutes, after which it is impossible to bend it any more. Higher heat than 212 will cause it to flake. The top cap can be fastened to the block by screws which will be covered by the handle which is cemented on. The face can be attached by brads, screws or drive-screws located under the hour-marks. The strips can either be cemented directly to the wood (before finishing) or bradded. All plastic parts must be buffed and polished before assembly. If desired, the back-hole can be covered by a circle of plastic sheet swinging from one screw at the top. Pocket-Pieces — A "Plastic Circus" Project No. 10 Material: 3/16" sheet or scrap. 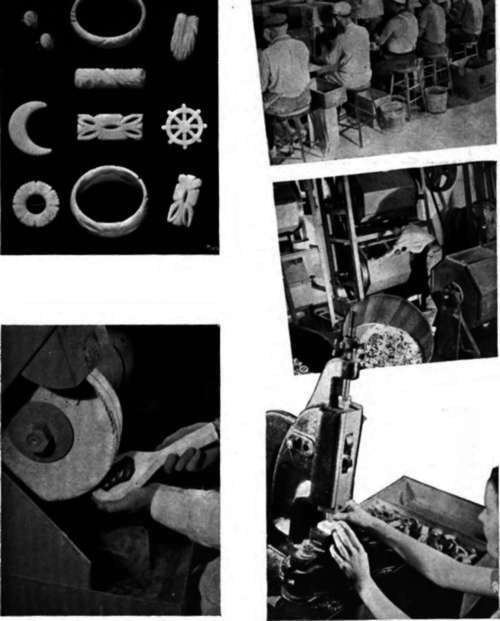 Plastics lends itself particularly well to the subject of "pocket-pieces" charms, lucky-pieces, watch-chain ornaments, bracelet danglers, and the like. Egyptian scarab pocket-pieces, which might also be used as ring-settings, can be filed out with triangular files and no other equipment, following the outline shown in the sketch. They can be made from a piece of the same material, can be carved as a chess-horse, which can go to make up part of a set, or serve as a pocket-piece or handle for some small box. The base-part can be turned on a lathe or shaped merely with a file by hand, and the carving of the head is a simple filing job. Similar objects are butterflies, fish, turtles, little seahorses, dragons and so on, some of which are sketched in outline in Figure 26 and 27. In slightly larger sizes, they are also used as dress-clips, with the metal clip portion attached to the back and for box-handles, inlays and general ornamentation. Care should be taken to choose a color of material appropriate to the design.